Something weird happened. I decided I was going to drop out of college. Now, don’t get me wrong – before I go into this story, I am not recommending you drop out of college. College works for some and doesn’t for others. If you are thinking about dropping out, I would be more than happy to talk with you and share my story. Then again, it’s all up to you and no one knows you better than yourself. Throughout this article, I’m going to take you through some of my experiences in high school, the few semesters of my college experience, my decision to drop out, and my plans for the future. Now let’s rewind to 2013. It’s the beginning of my sophomore year of high school in Greenbrier, Arkansas. One day I asked myself, “Are you happy with where you are right now? Are you being challenged enough? What do you need to do to get to where you want to be?” I mulled these questions over in my head. To get a better understanding of how I felt about these things, I turned to good ole pen and paper. I started to outline how I defined happiness. Was it money? Family? Success? What does being challenged mean to me? I thought about my limitations and previous failures; when was I challenged the most? I also focused my effort towards thinking about opportunities that would match what I truly cared about. I’ll admit, I honestly had no idea what I was doing, but putting things down on paper to make a plan really helped me out. All I knew at this point was that I needed to do something. I needed to get involved. I already had dropping out and not going to college in my mind at this time. There was just something about school that uneased me; I felt like I wasn’t making a difference. Having this heart to heart with myself was one of the best things I ever did. I started to search online for opportunities that matched what I cared about and wanted to work on – not what other people wanted me to do or expected of me. As a sophomore in high school, my options were fairly limited. I started with my home state because of the convenience. I was searching for college credit classes that I could take at nearby universities and came across a boarding school for high school students. It seemed really interesting, so I looked more into it and submitted an application hoping to land an interview. A few months later, I interviewed, convinced my parents to let me go, and then received my acceptance a few months after that. It was difficult to let go of the familiar at first, even though I was only going to be moving an hour and a half away. I was only 15, and the life I had in Greenbrier was easy; I had the support of my friends and family, I was breezing through school, and I didn’t have anything too difficult to deal with in my life. The reason why I’m saying this is because it was this uncomfortable change that challenged me; I didn’t want to be uncomfortable, I needed to be uncomfortable to push myself beyond my familiarity – it’s what helped me grow. From the point of beginning the process of applying to boarding school, I was hungry to do more. I didn’t want to be bored over the summer or work odd jobs, so I started searching for internships and summer programs. I didn’t have enough experience for a paid internship, so I thought entrepreneurship would be a good place to start. Reason being is because I already started a Minecraft server hosting business, failed at building a Bitcoin startup, and started my own tech review blog when I was 12 (also failed, miserably). I wanted to try again, but this time I wanted to be sure that the experience would help me build my network and lead me towards more opportunities in the future. Know everyone. I wanted to make sure I didn’t miss the chance to meet someone awesome. From the moment I arrived, I bothered everyone that made eye contact with me. I asked them where they were from, what they had worked on in the past, why they were here, what they were hoping to get out of the program etc. You would be surprised how many meaningful relationships you can form with people if you just take a chance and talk to them. Worst thing that can happen is that they don’t talk back or they ignore you. Learn as much as possible about anything I can. I didn’t really care what it was, as long as I was taking in knowledge, I was happy. Obviously, I learned about entrepreneurship because that was the focus of the program, but I took away a lot more than just that. I learned about different languages, cultures, experiences, and other people’s failures/successes (something I wouldn’t have gotten to experience if I wouldn’t have taken the jump to speak with people often). Build an awesome company, and leave a good impression. I tried my best at these by working really hard and failing a lot. I will admit, my team was not the best at the program, but we finished and built an awesome company. Once I got involved and challenged myself at every moment, it snowballed into opportunities I never thought I would get the chance to experience. After the summer program, our team wanted to find other opportunities to accelerate the progress that we were making. The LandMe team was spread across multiple states, but everyone was fairly close to Massachusetts except for me, so we decided that we would look for something there to help motivate us to continue building the company. We heard about QØ and decided to apply. 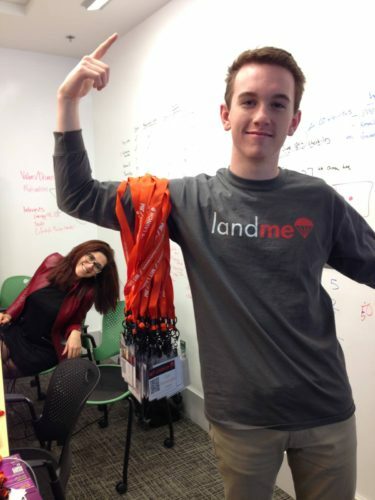 We were thrilled to get in with our idea Landme.org, and a couple months later and we were growing our business with an amazing group of students, business advisors, and program directors. Not only was this great for our team, but it was a terrific opportunity for me as an individual to network, hone my own skills as an entrepreneur, and search for future opportunities. Our team gained some amazing mentors, countless connections, and a keen sense of company focus/mission. Through Catapult I learned about Babson College, a well renowned entrepreneurship college. As college apps came around the corner, I spent a lot of time on my application to Babson, making it one of my goals to be accepted and get a good scholarship so that I could attend. The reason I’m mentioning this is because I did get accepted, and I did get good financial aid (I even committed when I got my acceptance). Family. My father got some bad news (medically), and no matter what I do in life, my family is always #1. I wanted to be close to him when he was dealing with his illness (even if it wasn’t that bad) and I also wanted to be there to support my mom as she took care of my grandfather (who was 94 at the time and required a lot of attention). Credit. Babson refused to transfer credit I earned at boarding school (upwards of 40 concurrent credit hours with the University of Arkansas system). I’ll give it to them; they have very specific curriculum/classes, but if I went to the University of Arkansas, I could finish two years faster than at Babson. (UofA was also much cheaper, even with scholarships to Babson). Babson just didn’t feel right. I visited campus twice, and from the interactions I had with people there, I didn’t feel like I was going to fit in. I already felt like I missed home and I hadn’t even started there yet. I can’t really explain this point very well, but I can say that it was one of the strongest “gut” feelings I have ever had. Everyone knows to always go with your gut (duh) – so I did. No one was surprised by the idea of me going to Babson – it was my “next step”. Everything I worked for led up to that point and everyone was very surprised that I chose not to go. The point I’m trying to make is that you shouldn’t ever move forward if it doesn’t feel right to you. Even if you get a job offer from the “#1 best place to work 2017”, that doesn’t mean that you should take it. If you don’t want to do something but everyone expects it of you, always put your feelings first. It’s your life and you have to live with the decisions that you make. By now, you may recognize a theme in my story – I always try and audit the situation I am in; If I don’t like the direction that I am headed in life, I change it as quickly as possible to match my goals/aspirations/happiness. During my first semester at U of A I was in the honors college, joined three student organizations, and pledged a fraternity. From the outside looking in, it would seem like I was happy with where I was and like I finally found my place. Pros: Friends from boarding school attend, close to home, social gatherings A+. presentation was considered teaching, and the university was filled with politics that made it difficult to succeed/make a difference. I decided to transfer to Hendrix College (even closer to home). There, I was able to change my major to something I was more interested in (Neuroscience – previous major was EECS). The class size went down drastically, and the administration/professors at Hendrix were much more willing to dig deep into the material and actually care about each student. I saved a bunch of money by living at home, and I was truly happy with the position that I was in. I reached out to a bunch of places about internship opportunities for the summer of 2016, and I came across a Facebook post about a summer program that a nearby Innovation Hub was hosting. I emailed my mentor (who knew people at the Innovation Hub) and asked her if she knew of any opportunities to intern at the program. She introduced me to the director of the program via email and I interviewed with him a few weeks later. I started working full time over the summer, then transitioned part-time when school started back up, and I loved every single moment of working there. As school began to ramp up, I began to get the same feeling that I did when I visited Babson and attended U of A – something felt off. I really began to think about what it could be: it wasn’t my job, it wasn’t my friends or my social life, it wasn’t the quality of the teachers or the material, and it wasn’t my family. I couldn’t think of anything that was truly getting in the way of me being the happiest I could be. Then one thought popped into my mind – “Is it school? Like… not the teachers or the quality of material… but just: school?” I thought about what it would be like to leave school; what would I do? Where would I go? How does that match up with where I want to be in 5-10 years? I learned the most and was the happiest – Catapult, Landme, interning at Launch, working at the Hub – none of them involved school. It was never about school for me, rather, it was always about the education. It was at this point that I realized our society incorrectly equates knowledge with accreditation, and because of this, I started looking for other things to do. I should note that I didn’t automatically go from the above thought process to dropping out. I wanted to make sure I had a lot of options to choose from (always better to have a backup plan, or two). I put in for a study abroad application to China with the current college I was at. Someday I want to live and work in China so I figured that going to school there would let me see what it was like while boosting my speaking skills in Mandarin. I kept my current job, expressed interest in moving back to full time, and also applied to 3 full time positions in Boston through a popular website called AngelList. The reason I chose Massachusetts was because I already had a few ties to the area (Catapult and MIT) and I really enjoyed living in Cambridge the last two summers. I got an email from Formlabs, a company listed on AngelList saying that they were interested in speaking with me. I scheduled a phone call, told the employee who interviewed me my life story, my goals, and why I wanted to work at the company and then waited to hear back. We had another phone call a few weeks later and he basically explained that they would like me to come in for an in person interview. I spent a good amount of time preparing for the interview. To be completely honest, I watched a lot of YouTube videos and read a lot of material from their website. I already had some background in 3D printing, but Stereolithography (The technology Formlabs printers’ use) was a whole different beast. I would say that I prepped for about a total of 15 hours before I went into the interview, and this made me extremely confident and knowledgeable about the product. 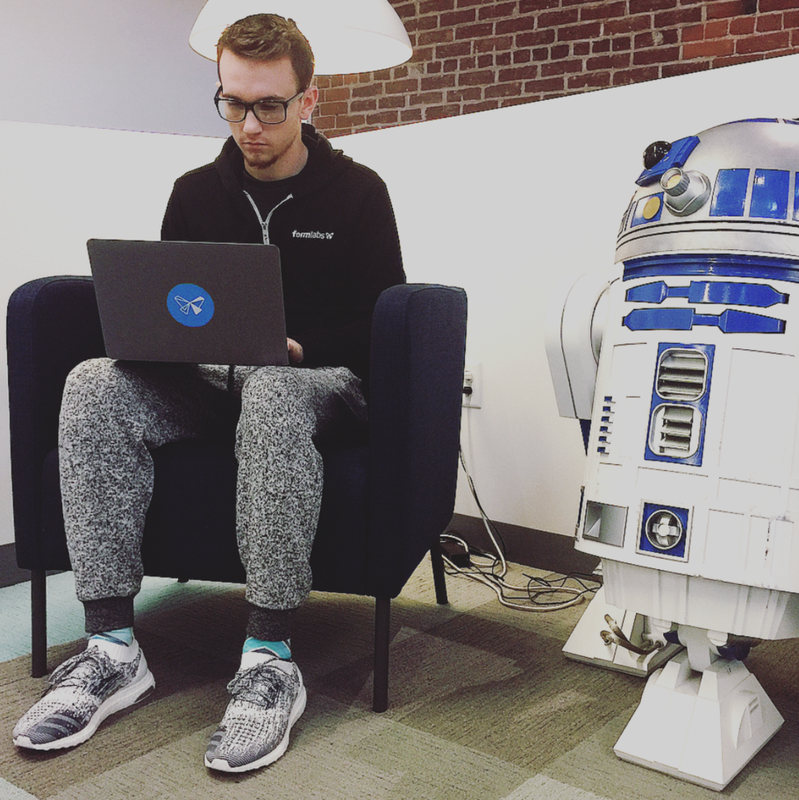 I interviewed with the guy I spoke with on the phone, the head of Sales, and the CEO. After all that was over, I hung around the office and met some other people before I headed out. All in all, I felt like I did fairly well and I was very excited about hearing back. This was an opportunity of a lifetime. Who else at 19 gets the opportunity to go work at one of the coolest startups in the world? School will always be there. If I choose to go back to school, I’ll always have the opportunity. It made me nervous and uncomfortable, and it felt good. I could tell that this was one of the times where I was going to be challenged more than ever, and I live for a good challenge. So… I found a place to live on craigslist about a mile away from Formlabs HQ. I contacted the broker for the place who put me in touch with two other people looking for a place to live and we filled out the rental application together. I went to Hendrix and notified all of my teachers that I would be leaving. I had a meeting with the financial aid department and made sure everything was in check. Filled out some paperwork and then boom. I was out. I packed up all my things that I wanted to take with me, and my mother and I began a two day road trip to Boston. It was a very hectic week between the time I signed my offer and moved – just to give you an idea of how fast it happened, I actually signed my official lease on the drive up to Massachusetts. Once I got to Boston, I moved in and settled everything with the apartment. Four days later I took my first walk to work and began my journey into the realm of the 3D printing industry. I have a lot of plans from here, and I’m never going to stop moving forward. One of my biggest passions is gaming so I’m going to start up a YouTube channel and a Twitch. Landme 2.0 is currently in the works and I want to pivot the site into a more personalized service to help high school students land awesome opportunities. This is definitely only the beginning for me, and I can’t wait to keep working on things that I love. If you would like to talk with me more about my experiences or want to stay up to date with what I’m up to, please add me on the social media accounts below! I have also included some links to some things I am following and interested in. Special thank you to my family (especially my parents), my mentors/co-workers, and my best friend. By the way, Formlabs is hiring. If you’re interested in working at the best 3D printing company in the world, take a look at these job postings and contact me if you are interested. Without knowing where it would lead.